ReSolve® Biliary Locking Drainage Catheter receives 510(k) clearance! I am pleased to announce that the ReSolve® Biliary Locking Drainage Catheter has received 510(k) clearance and is available for sale in the US. The ReSolve Biliary Locking Drainage Catheter has been available in Europe since July of this year and has had good success. These catheters are indicated for drainage of bile within the biliary system. Often biliary systems need to be decompressed due to bile duct stones, extrahepatic, or intrahepatic tumors, and primary sclerosing cholangitis, among other reasons. In addition bile may also need to be diverted from a bile duct leak. Biliary system lesions do not always occur in the same location in every patient. Because of this, Merit offers catheters with two different drainage hole configurations to accommodate patient anatomy and multiple disease locations. Correct catheter positioning is important in these procedures. 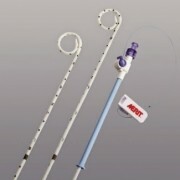 The catheter features a radiopaque marker band near the proximal shaft drainage hole, and non-radiopaque depth markers the entire length of the catheter to help with fast and accurate positioning. To learn more, check out the ReSolve® Biliary Locking Drainage Catheter product webpage. https://www.merit.com/wp-content/uploads/2015/09/image1-17.jpg 346 325 Merit Medical https://www.merit.com/wp-content/uploads/2018/11/merit-header-logo.svg Merit Medical2014-12-17 05:02:002018-08-03 11:20:26ReSolve® Biliary Locking Drainage Catheter receives 510(k) clearance! 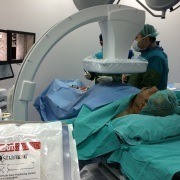 Merit Medical’s Ostial PRO Stent Positioning System was recently used for the first time in Turkey. The case was a renal aorto-ostial lesion performed by a cardiovascular surgeon at a University Hospital. “This is a product that can save lives,” Şenol said, adding that Merit Medical offers clinical support to doctors and hospitals that are interested in utilising the Ostial PRO. To learn more, contact your Merit Sales Representative or visit the Ostial Pro page on our website, which features a product video, several case studies, and documents such as brochures and instructions.